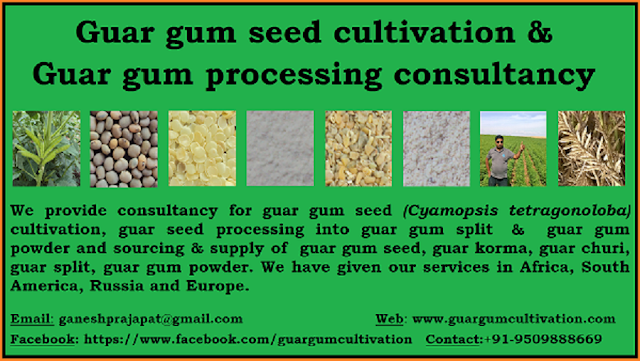 Though Guar is hardy crop it can survive in worst conditions but under intensive agriculture many diseases attack the Guar / Guar gum seed ( Cluster bean ) Cyamopsis tetragonalaba crop right from germination stage to pod formation stage. Seed treatment before sowing is key of effective control of disease. Major identification symptoms along with effective management of control measures of disease are as follows. Wilt / Root Rot of Guar / Guar gum seed ( Cluster bean ) Cyamopsis tetragonalaba is a sevior dises in Guar growing belt. The disease attack on guar crop where crop rotations is not followed properly. It is a soil born disease. Wilt / Root Rot of Guar / Guar gum seed ( Cluster bean ) Cyamopsis tetragonalaba can managed properly with the seed treatment. Farmers should avoid to take Guar crop on same filed year after year. Seed treatment with Moncern (3Ml/Kg) + Carbendazim (Bavestive 2gm/Kg) + Soil application of Trichoderma herzinum (1.5/Kg/Hac) will help reduce the incidence of this fungal disease Wilt / Root Rot of Guar / Guar gum seed ( Cluster bean ) Cyamopsis tetragonalaba. In case of continued problem during crop growth, spray of any of these fungicides cam be undertaken – Blitox / Blue copper (20 gm/litre water), Mancozeb ( Dithyane M-45, 1.5-2 Kg/hactare, 0.15-0.2% spray) or Bavestive (0.1%) spray. About 500-700 litre water is required to spray the recommended dose of fungicides in one-hectare area. Bacterial blight is caused by a bacterium Xanthomonas cyamopsidis. Bacterial blight disease infestation mostly occurs during kharif season crop at the surface of leaf. The spot of Bacterial blight are intraveinal, round and well defined on the dorsal surface of the leaf. The pathogen invades vascular tissues and causes flaccidity of the affected portion. The flaccid spots become necrotic and turn brown. The infection advances to petiole and stem. It results in blackening and cracking of stem. Resistant varieties and certified seed should be used for sowing purpose. Seed should be treated with 250 ppm of agrimycine or 200 ppm of streptocycline for 3 hours. Spray of streptocycline @ 5 g or plantomycine @ 50 g with 100 L water per hectare should be done at 35-40 days after sowing. The casual organism of alternaria leaf spot disease is a fungus Alternaria cyamopsidis. The symptoms of Alternaria leaf spot of Guar appear mainly on the leaf blade of leaves as dark brown, round to irregular spots varying from 2 to 10 millimeter in diameter. The water soaked spots later on turn grayish to dark brown with light brown lines inside the spots. Spray of zineb @ 2 kg in 500 L of water per hectare should be done at an interval of 15 days at least twice to control Alternaria leaf spot of Guar. Anthracnose of Guar is caused by Colletotrichum capsici f. cyamopsicola. The symptoms of the Anthracnose of Guar appear on the leaves, petiole and stem in the shape of black spots. Spray of zineb @ 2 kg in 500 L of water per hectare should be done for controlling Anthracnose of Guar . Powdery mildew of Guar disease is caused by a fungus Erysiphe polygoni. The symptoms of the disease start with white powdery growth over the leaf surface. This white growth consists of the fungus and its spores. The disease can be controlled by spray of wettable sulphur like suffex at the rate of 2-3/ kg ha or dusting of sulphur powder @ 20-25 kg/ ha or spray of dinocap @1.5 ml/ L of water.